These Pet Rescue level 643 cheats and tips will help you beat level 643 of Pet Rescue. The objective of Pet Rescue level 643 is to rescue 4 pets and get 50,000 points. 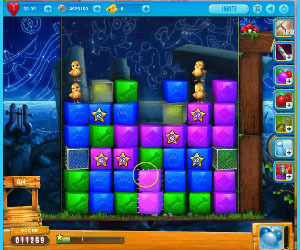 At the top of the board in Pet Rescue Saga level 643 you will have a lot of room to make large combinations. As you work through the top, you will come across a few rows that are locked. Ignore these locked blocks until you have made enough progress at the top of the board. In this level you want to take one section of the board at a time. The board will sections that have locked blocks and metal crates. When you get to the locked blocks, focus on unlocking the key from the glass block. To break the key open you will need to smash it on one of the locked blocks. Once the blocks have been unlocked you will be able to make your way down the board. You will also come across metal crates. However, these will not be as difficult to remove. The balloon booster should continue to fill throughout the entire level. Continue to make large combinations on the board to help fill it up more quickly. Once the balloon booster has been activated make sure to place it on a block where it will do the most damage and help you to bring down the pets.